This one can not be missed out on! A true classic labret that can be worn in many different places. 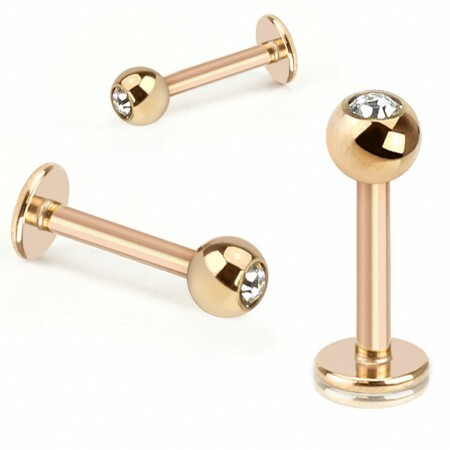 Although the labret might officially be a lip piercing, it can also be used for ear piercings. Especially the helix is a perfect place. This particular labret carries a layer of rose gold. This way you get the luxurious and warm feel of rose gold but you'll only pay a fraction of the price. Downside is that the labret becomes vulnerable to wearing down. By making sure that the labret is not exposed to water, soap, sweat etc. you can make sure this labret stays pretty for a long time. To give the whole that little bit extra there is a clear crystal in the ball. This crystal is firnly placed inside the ball which means that chances of losing it are slim to none.